Would your life improve if you had more self confidence? 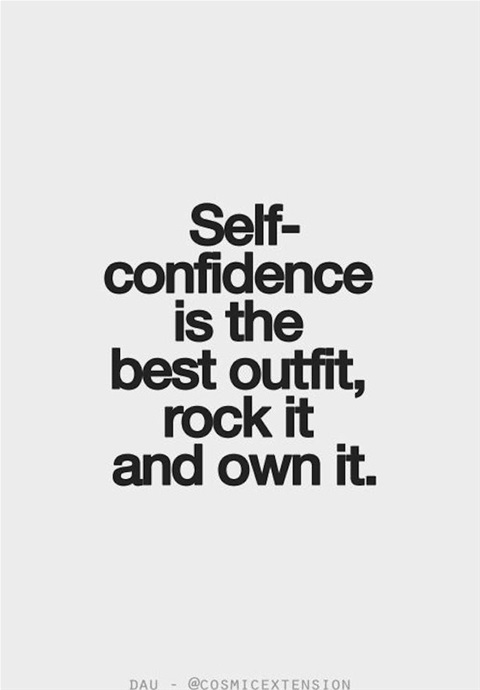 I have been asked by one of my followers to address "lack of self esteem/confidence"
Lets face it, this is a subject matter we can all relate to and at some point in our lives have experienced, if only for a brief moment. Unfortunately I dont have the magic answer. One persons situation is different from the next and there are varying degrees of confidence. Without having individual discussions, the best approach is to generalise and put together a simple plan to follow. So I am going to briefly cover a) how to carry yourself with confidence e.g. in a work situation. b) How to feel confident with being you. I am of the opinion that lack of self esteem is a symptom of the cause. Something or someone has triggered this effect and it may be a good idea to uncover what the trigger was. The good news is - as easy as it was to trigger lack of confidence, it is possible to reverse the effect again with a trigger (Google creating trigger). "I will never be able to do this" "I am not good enough" "I can't"
Are these words familiar to you? Let me start by saying - self confidence is not about what you can or cant do - it is what you believe you can or cant do. I have said it before and I will say it again and again - Your unconcious mind only believes what your concious mind tells it. Have you ever considered what message your body language is sending to your brain. Recent research suggests that the way you sit or stand can affect the way your brain functions. Carry yourself with confidence and within a matter of minutes the chemical inbalance within your brain can change to a degree that would affect the way you feel. Your brain would believe this is who you are. You dont have to make massive multiple changes to make a difference but by focusing on one or two aspects of your body kanguage, it is a fact that you can change the message your brain will receive, ultimately changing the way you feel about yourself. This will have a knock on effect on the rest of your body and you will come across as more confident and capable. I am a firm believer that most things we do or feel have been formed by creating a habit, be it a good or bad one. This always give me the confidence to take risks or try something new. If I create a habit and it is not working for me, I will focus on braking the habit and creating a new one. It can be challenging but also fun and exciting. I love taking on new challenges and experiences - I find it really energising. If your aim is to create confidence in situations at work, take on the challenge, become an actor. This will create your habit. Your colleagues only know how you are feeling if you tell them or show them with your body language. You may be crumbling inside but if your body language tells them otherwise, they will look at you with a more positive perspective. Really! it is as simple as that. In my job I regularly have to present and spend alot of time preping in terms of local environment, facts and figures, evidence and statistics - however all of that would mean nothing if I didnt believe in the information I was presenting and THAT would mean nothing if i didnt believe in myself. When I was new to the job, Just Before going into a meeting I would use my trigger to get into my perfect state of confidence. Somehow this instilled the habit and the trigger now is no longer part of my prep. My body sent messages to my brain which now believes this is who I am. once you have pulled it off you will begin to enjoy it. The key concept to always have at the forefront of your mind is the circle of influence. Do not allow your lack of confidence to be determined by aspects of your life that you cannot control. For example your age or rejection (the end of a relationship - you cannot make someone love you) etc You cannot change these things but you can change how you react to them. Focus on reacting in a more positive way to the things you cannot change and focus on changing the things you can. I understand building self confidence is a difficult and lengthy process and involves not just restyling yourself but restyling your mind. There are tips on restyling your mind in my other posts and there will be more to come. Also my next book will be available very shortly "The Gateway To Happiness Begins With Being Self-aware" Let's start with a quick fix. You may want to reinvent yourself or just give yourself a makeover. Buy the best haircut you can afford. Prioritise hair over clothes - you wear it every single day of your life and it is one of the first things people notice. Whatever style you choose, you have to keep it in fantastic condition. Get a makeover. Make up applied well changes your whole look. Seek advice from a professional or go into a department store and find someone behind the counter who has a look you like. Develop yourself a routine. It really does build your confidence and motivation. Treat yourself to a regular facial - I have been going to the same person for my facial for 15 years. I have one a month called the "Renu" it is amazing. I use the same creams at home which by association relaxes me to the core. Promise yourself the gift of ME TIME - wether it's an hour of pamper, an extra hour in bed, a long walk with the dog 🐶 or swimming, you get the gist! Commit to putting yourself high on the agenda. This is important for you and everyone else. When you have made that leap you are half way there. Focus on your footwear. The more comfy your shoes 👠, the more active you will be and the more confident you will feel. You can't beat a good haircut 💇 and comfortable great looking shoes. Most importantly believe in yourself. Challenge your state of mind and value your age - whatever your age is.